This week for Sweet Melissa Sunday the recipe was for sugar cookies. 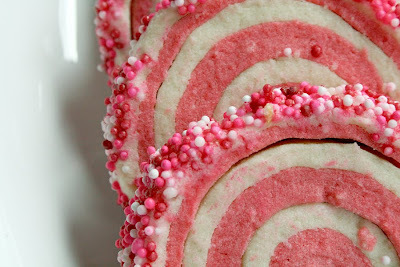 I have never met a sugar cookie I didn't like. And even if I didn't like it, I ate it. Ha ha!! So I was excited to try this recipe. I have been making sugar cookies since I was little with my mom and was interested to try a new recipe. Nina from Nina' Cupcakes picked the recipe this week. 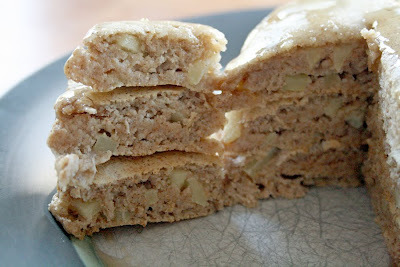 If you want more info on the recipe, please check out her blog!! I had high hopes of using this sugar cookie dough for a fruit tart, but time slipped away from me this week. Plus, I really wanted to use a tart pan, but I don't have one. 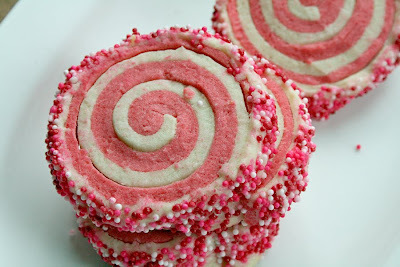 SO...I ended up making these swirled sugar cookies with the dough. 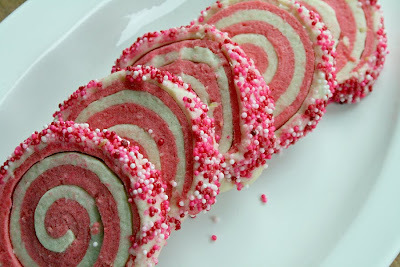 I first saw this idea on Heather's blog, Sprinkle Bakes. I colored half the dough red and kept the other half plain. I rolled out both halves into equal sized rectangles. I placed the red on the white and then rolled it up, like a jelly roll. I them attempted to roll the roll in sprinkles. Um...yeah. That didn't work out too well!!! The sprinkles did not want to stick. I sliced the roll into cookies and before baking them, I rolled each slice in sprinkles again trying to get more to stick!! They baked up nice and crisp on the outside but soft on the inside. It was a decent tasting cookie, could have been a tad sweeter for my taste. But they were eye-catching and everybody wanted to try one. 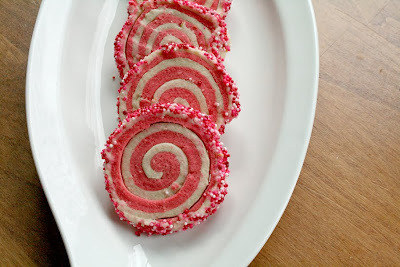 I think they would have been good with a bit of peppermint extract along with the red food coloring. Just to add a little more flavor. If you want to see what the other SMS bakers did this week, check out the blog roll call HERE. It was a decent cookie but i'm not sure I will switch over from my tried and true sugar cookie recipe. But it was definitely fun trying something new. And these would be really cute for a kids birthday party or green for St.Patty's day or in pastel colors for spring. Thanks for stopping by and have a sweet Sunday!! It seems like everywhere I look, I am seeing soft pretzels turning up on food blogs. And most of them reference a recipe from Alton Brown. So I finally broke down and decided to try them. Because I looooove me some carbs!! Come on, after an 8 mile run I deserve some carbs...yes?? Some salty, sugary sweet carbs? Yes?? You can find his recipe HERE on the Food Network site. The dough rose quite nicely! I lined them all up on a parchment paper lined cookie sheet and they were ready for a water bath! No they all aren't uniform or the same size, but that's party of their charm. Each pretzel was dropped into boiling water for about 30 seconds, then taken out and placed back on the cookie sheet. Half of the pretzels I dusted with salt and the other half with a cinnamon/sugar mix before putting them in the oven. Into the oven they went for about 15 minutes. It smelled just like Wetzels Pretzels in here!! I'm not really one to toot my own horn (too much), but these were fantastic!!! I can't take credit for the recipe but I can take credit for the execution, hee hee!! They were big and chewy with the right amount of 'crust' on the outside. Oh my, these were devoured so quickly!! Next time I think i'll add more sugar/cinnamon mix before baking, they were not sweet enough for me. And I'll invest in some big pretzel salt. My husband loved them, so did my kids. No more mall soft pretzels for us! This recipe is going in the keeper file!! Aren't they purrrrrty????? I actually had quite a hard time with the raspberry color. I couldn't quite make it work, I struggled a bit with it. But this is what I ended up with. The pop of raspberry is the star and the button. The stamps are PTI and so is the paper. I think it needs something else, but I just couldn't make it match what was going on in my head. Does that ever happen to you?? So I stopped while I was ahead, hee hee!! That's about all I got today! I need to help my son with his crossword puzzle and get the glue dots out for my daughter (she's got something crafty that needs to be made RIGHT now...I know the feeling, LOL!!). Have a great night everyone!! Have you been over to the Croppin' Paradise blog lately?? They are having amazing giveaways that feature NEW product from CHA!! You must get over there to see what they are giving away. And if you are in the mood for some fun lovey-dovey papers, check out the Persuasion line by Bo Bunny. Here's my sweet daughter posing for the perfect photo for me! 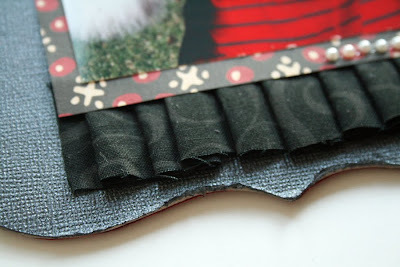 I did lots of distressing around the edges and cut out frames and saying from the patterned paper. I love this thick pink ribbon, perfect for bows. I also added a touch of stickles to each petal of the flowers. Croppin' Paradise is getting NEW CHA product in everyday. Come on over and check out the store and the message board. Lots of fun stuff going on!! I love food blogs. Maybe just as much as I love scrappy and crafty blogs. 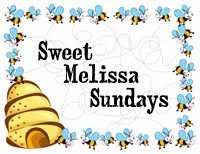 I've been noticing quite a few bloggers posting on Sundays and referring to Sweet Melissa Sundays. I had to find out what it was. Turns out, it's a group of bloggers that are trying recipes from this cookbook, The Sweet Melissa Baking Book. I bought the book and now I am going to bake every Sunday from this cookbook!! How fun is that??? Here is the first recipe i've tried...Strawberry Lemonade. Jessica of My Baking Heart picked the recipe and it's really delicious. I'm a sucker for anything sweet so I was excited to try this. AND this week our local strawberry guy was HERE with fresh strawberries!! I've never seen strawberries available this early in the year and I was skeptical they would be any good. But they are quite sweet and really juicy. Picked this morning!! 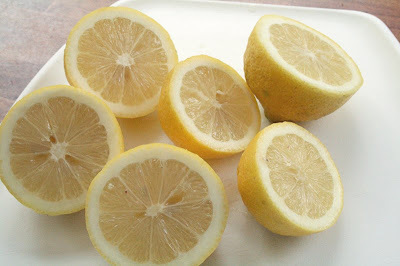 And we have a lemon tree in our backyard and the lemons are perfectly ready. You can't beat homegrown and local fruit for my lemonade today. 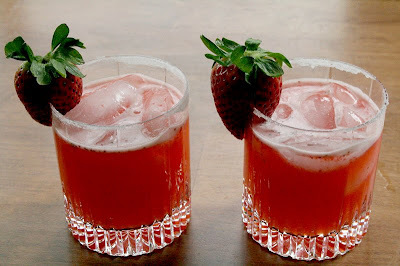 I rimmed the glasses with fine sugar and garnished with a strawberry. This stuff is delicious, reminds me of summer and makes me wish summer was here now! My kids loved it and even my husband, who is not a big sweets guy, liked it too. It was a fun first recipe to try! If you want to check out all the SMS bakers, check it out HERE. It was nice here today, but the clouds are rolling in and it looks like possible rain. I'm going to curl up with a nice book and sip some lemonade while my kids watch a movie. Happy Sunday everyone!! Happy Saturday morning!! Are you looking for something to make for breakfast? How about lunch...or even dinner? 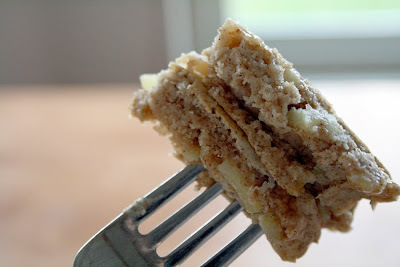 These apple cinnamon pancakes will treat you right. They are hearty, filling, sweet, and cinnamony. -Mix the flour, baking powder, flaxseed and cinnamon in a bowl. Stir in the apples. -In a small bowl, mix the milk, egg, oil, and honey. Pour over the flour mixture and stir well. 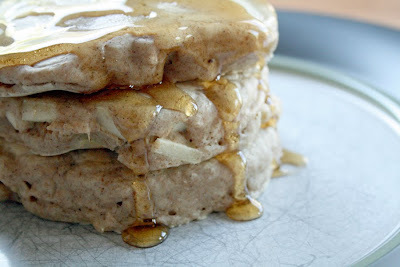 -Add about 1/2 cup of pancake batter to the griddle. Cook until done all the way through, flipping halfway. I serve these with a little bit of butter and some maple syrup. They fluff up nicely and are really thick and oh, so good!! Look at those layers of apples. My kids love these and I think my son eats more than I do. He is quite the eater!! When he's a teenager, we might have to take out a 2nd mortgage just to pay the grocery bill. I hope you had something yummy for breakfast. Have a great Saturday everyone!! And one more!! I really like the raspberry fizz with the smokey shadow...and of course, polka dots!! I think I was on a polka dot kick, I used them on every single card! If I had to pick a favorite stamp set from Papertrey Ink, it would definitely be Polka Dot basics. I use it all the time. I hope my sister sends out all the cards and gets some good use out of them. I loved making them, it was fun figuring out a design and them making 4 of them. I cranked out 16 cards in one afternoon. Hope you're all having a great week...Thanks for stopping by!! Something Super FUN and a mini album!! 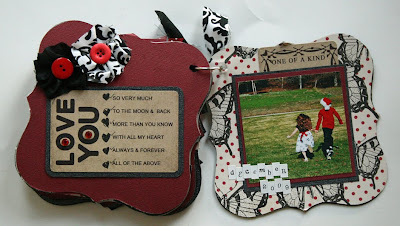 And I have one more project to share from the February Kit at Color Me Daisy. When I first saw the colors in the kit, I immediately thought of a photo shoot I did with my kids right before Christmas. My daughter had a holiday dress that was black and red and white and the photos match the paper perfectly. A mini album was born! 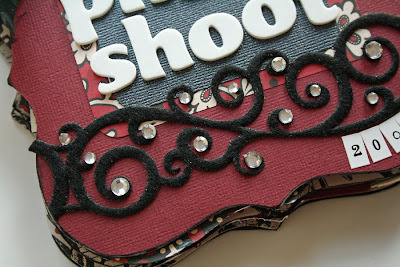 I used a Basic Grey chipboard album that was gathering dust in my closet and got to work. I love the felt with the bling!! I covered each page with alternating cardstock and patterned paper, then added my photos. There was lots of fun fabric in the kit that I incorporated as well. Here are some of the other pages, I pretty much stuck to the same theme. 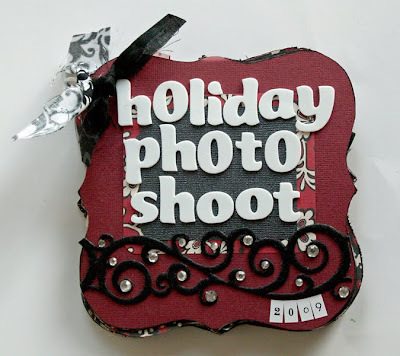 Cardstock, patterned paper and one photo per page. I find that a formula helps me create a mini album much easier. I really enjoyed making this and will definitely be making more minis in the future!! Thanks for stopping by today!! Happy Valentine's Day everyone and I'm back with another Sweet Sunday! 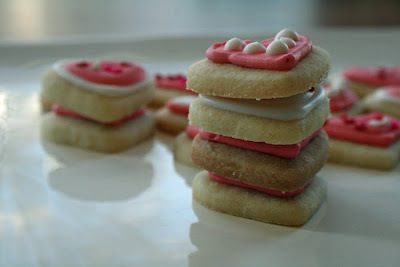 Today I am featuring my mom's recipe for Sugar Cookies. 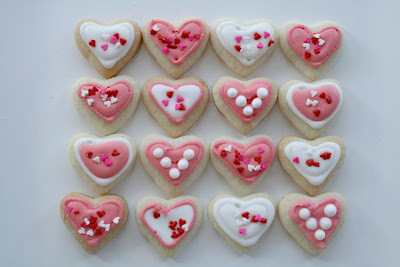 I have been making these sugar cookies with my mom forever. We always had decorated sugar cookies for the holidays for as long as I can remember. Tins and tins filled with cookies!! And now I use my mom's recipe. I don't know where she got it, but it's definitely a keeper. I know everybody has their favorite sugar cookier recipe, and this is mine. The orange peel really makes the cookie. Gives it a little punch of flavor without being overwhelming. I have made them both with and without the orange...and I prefer adding the orange peel. I baked a few batches of big heart cookies for my daughter's 1st grade class's Valentine's party and I had a bunch of dough left over. So I made cute little mini heart cookies!! Decorated with royal icing and heart sprinkles. My daughter helped me with the sprinkles. I used stiff royal icing to pipe the outline of the cookies and then flooded the middle with thinned out royal icing. I was doing alot of experimenting with consistencies, I'm still not good with figuring out if it's thin enough or thick enough. Lots of trial and error!! And still trying to make all the cookies the same thickness or else you get browned or burnt ones in your batch. See that brown one in the stack??? Too thin on the pan!! I downloaded the image from Twig & Thistle. 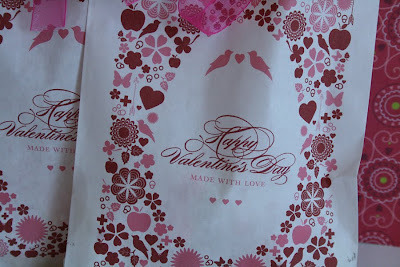 I then put the bags through my printer and printed the Valentine image on the front. Super easy!! Punched some holes in the top, added some ribbon and added the cookies. 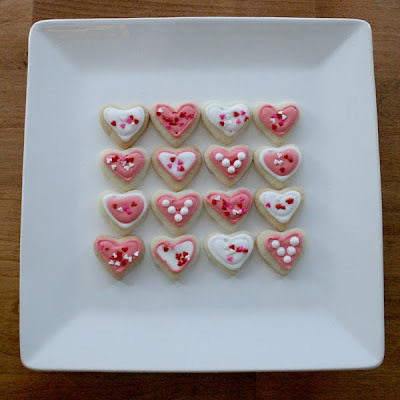 A fun way to give some Valentine treats! I hope you all have a wonderful Valentine's day with your family and friends! Thanks for stopping by for Sweet Sunday! Conversation Hearts Crop at Croppin' Paradise! Hi Everyone!!! I am excited to be bringing you my challenge for the Conversation Hearts Crop over at Croppin' Paradise. 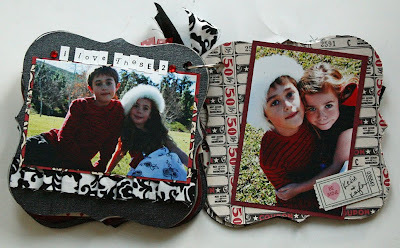 My challenge is...Scrap a 'Love' layout without using traditional 'love' colors. No pinks, blacks, reds, whites. You get to think outside of the box for this one! Here is my layout. I used the Boyfriend line from Cosmo Cricket to create this layout about my sweet husband. I don't do many pages just about him and I thought this paper was perfect for a 'love' layout that was not all girls and flowery. Not like there's anything wrong with that...but not for my husband. Hee hee!! 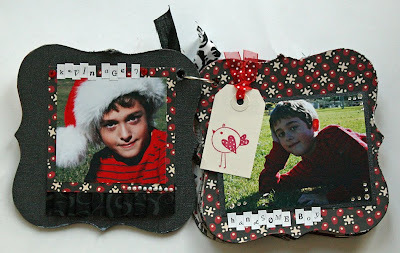 Come on over to the Croppin' Paradise forum and link us up to your layout for this challenge. And don't forget to check all the other challenges that have been going on this week. Tomorrow you will want to hop over to Joan's blog for a Saturday challenge! Hope you see you on the boards! So...there is one last online crop at Color Me Daisy and it starts today. Come on over to the message board to Organize Your Heart! My challenge has been posted on the board, it's called Organize Your Photos. 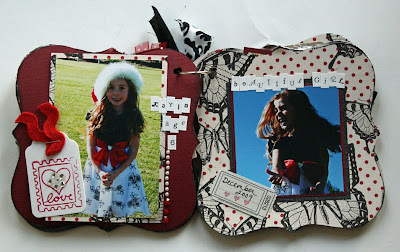 The challenge is to use a photo collage on your layout AND use the word Love in your title. I used scraps from the January kit to complete this layout. I also downloaded a photo collage template from Scrapbooks Etc. They are super easy to use. I just opened my template in photoshop and dragged and dropped my photos into the spots. I enjoyed using those chipboard cupcakes that came in the January kit! So come on over to Color Me Daisy for one last online crop!!! See you there! JUGS #19, Pile it On #5, and MORE!